The Sound of Stamping: My Christmas Cards! These little babies have recently been sent out to my nearest and dearest so I hope that they enjoy them because they were a labour of love! I have a "thing" for the Pool Party colour and knew I wanted to use the new tulle ribbon, champagne glimmer paper and Heart of Christmas stamp so the design just grew from there. 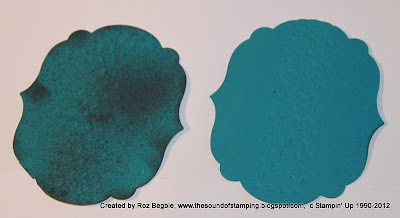 ... or the background trees stamped in Crumb Cake spritzed with Pool Party or stamped in Pool Party spritzed with Crumb Cake - these are difficult choices! I have to show you the difference that the new Stampin' Spritzer tool makes too. It's definately different to the Color Spritzer Tool which attaches to a marker. The new tool actually holds water and a few drops of whatever coloured ink you like (in this case Early Espresso) then sprays it on! How cool is that? Better yet, it's only $NZ5.95 for 2! 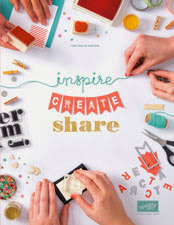 These all look amazing. 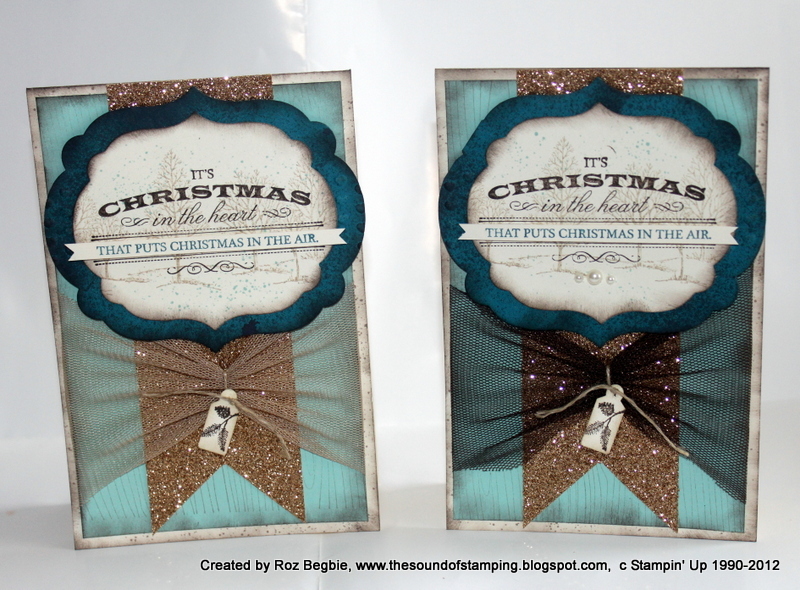 I think I like the top left one with the crumb cake tulle. You can see more of the pool party underneath. I am also impressed with your step card. 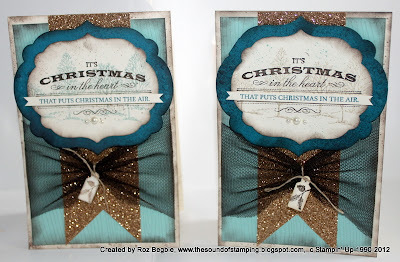 Beautiful colour combinations, Roz, and great use of stamps. My favourite is the top left card, too. 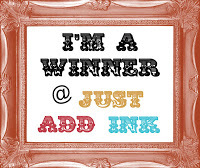 Thanks for joining us at Just Add Ink. Merry Christmas! Roz, l think they are both beautiful! 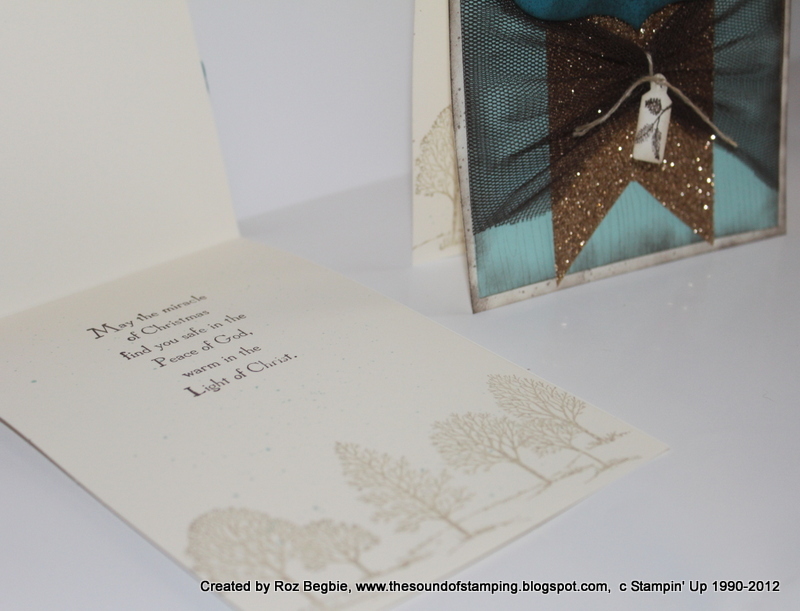 Those colours make such a lovely combination with the gold glimmer paper. 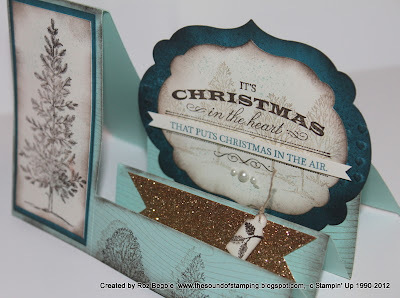 Thanks for joining us at Just Add Ink and have a lovely Christmas!